Attendees saw it last year, and just like clockwork, the blue stage demands its presence to be known throughout Boston Calling's second day. With acts ranging from ambient electronica to the grimiest modern hip-hop flows, there was a constant flow of fresh faces to this fairly isolated stage. This pushed our irresistible curiosity towards finding out how the day would progress in the area. Here are our findings. Right out the gate on the scorching hot Saturday was Tauk, a must-see band referenced in our most anticipated acts post. Their fun jam was welcomed with the open arms of an intimate audience, most of which knew exactly what each of the four members brought to the table. For this show, is seemed like the real stand-out band member was Isaac Teel, having demonstrated a killer skill set on the drums. While this band has grown a reputation for their opening slots at festivals and on different tours, their jams on the blue stage show a promisingly funky future. All we knew going into Mount Kimbie was an affiliation with Ninja Tune records, a record label founded by the late and greatly revered Japanese producer, Nujabes. Well, anyone familiar with the label and it's collection would've been pleasantly surprised, as Mount Kimbie brought the crowd a tranquil afternoon soundtrack. While their music is well-acquainted with the likes of Bonobo or Four Tet, who have often performed DJ sets, Mount Kimbie grooved on a fascinating live set up that we couldn't wrap our heads around. Core member Kai Compos, pictured in the white t-shirt, walked back and forth to play between two separate sets of analog gear, as well as his own guitar. Behind them visuals of beautiful landscapes, as well as abstract and continuously multiplying patterns, giving each sound produced some type of movement. As many electronica acts start gravitating towards mediocre live shows, as simple as MIDI drumpads, the Mount Kimbie gang truly stand out for their innovation and unique flavor. The green stage finally gets its name on the board as somewhere we attended. This time it was to see legendary rock duo, Royal Blood. Mike Kerr, pictured on the left, provided the bass and vocals that could only be accompanied with Ben Thatcher's immense sounding drums. The two put on a memorable show, with heavy sounding guitar work demanding the attention of rock fans, many of which knowing Royal Blood as a household name. The two put in a lot effort to deliver on the hastily acquired hype, with Mike Kerr supposedly leaving the show in an ambulance due to a broken foot. Touche Mike, touche. Brockhampton, one of the most recent and revolutionary hip-hop collectives, had the upmost of a demand for their performance on Saturday. Despite a recent issue within the group, causing them to cancel the rest of their tour dates, members Bearface, Dom, Joba, Kevin, Matt, and Merlyn stormed onstage for a heart pouring performance. What started off as Bearface singing out a slow ballad with angelic vocals, turned into the boys commanding the crowd with ease, as each beat drop lead to a more rambunctious pop-off. Brockhampton was one of the acts that really showed up, giving a raw and emotional performance despite tough times. Oh Tyler, perhaps the biggest contender for the festival's unofficial headliner. The blue stage was swarming with people all day, many of which sporting the iconic OF donut on thier hats and t-shirts. It was clear that this performance would be the one to end the night for many of these new age hip-hop heads. 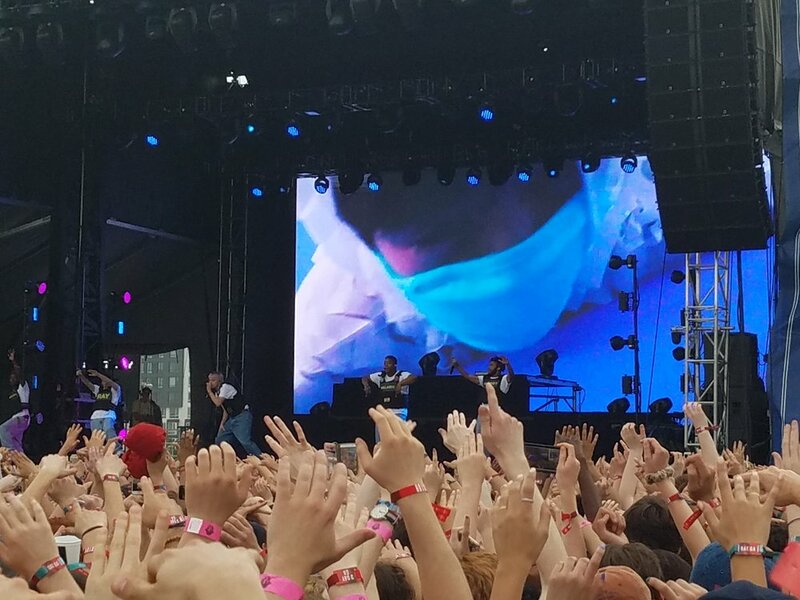 The next hour and a half was awe-aspiring moment for anyone familiar with Tyler; especially older fans, who may now see the album in a new light. After all, most of his songs were given a crucial facelift through his on stage presence-- unrivaled by anyone throughout the whole weekend. His latest track "OKRA" is a prime example, which can be found being performed in the video below. Like many artists have fans that groan about shifts from older music, Tyler doesn't stray far from the line. He humored those fans with a few classics off WOLF, and joked with them about how "that's all you're getting". Tyler's showmanship has skyrocketed with the success of his career, and will be one of the many traits to keep this flower boy's name buzzing in the music industry. Not gonna lie, chicken just sounded really good at the moment. Deans did a good job, especially with a free addition of fries. .This may be the most criminally underrated addition to Boston Calling, and that's how great of a job they did with merchandise. Rather than stick to the format of every other festival, just artist t-shirts and posters, they brought in the experts. Holding it down next to the general merch tent was Newbury Comics, who came prepared with CDs, Records, and a ton of absurd extras. They also came out to the festival with a prize wheel, some of the prizes that could be won include totes, inflatable beach balls, and gift cards. Also making their Boston Calling debut were Third Man Records, taking a new approach to the food truck craze. However, instead of tacos or kebab, you'll find the most vintage and personalized records sold at the stadium. Most of the hype appeared to be around the special Jack White records, colored variations of his work that sold out in a matter of two hours. The people inside were incredibly nice, always wiling to share the record truck's story, as well as giving the lowdown on where they can be expected this festival season. Love it or hate it, this shows a big move from the Boston Calling team towards expanding the number of attractions seen on their grounds. We hope to see this taken even further in 2019, maybe even with the addition of local record stores. Somebody call Cheapo! Concertgoers cooling down after Mount Kimbie. That concludes day two of Boston Calling. We're now left with the question, what could possibly happen to close off the festival's biggest year yet? Guess we'll have to find out tomorrow, tune in for details regarding Eminem, Thundercat, and much more.